The Global Crisis highlighted a number of weaknesses in the banking sector. Excessive leverage, low liquidity buffers, and inadequate levels of capital were seen as the main sources of banks’ fragility. In response, policymakers approved the Basel III regulatory reforms to enhance banks’ resilience. On the capital side, regulation has been tightened by introducing higher requirements. Under Basel III, banks can meet a fraction of their Tier 1 capital requirement with hybrid debt-capital instruments, such as contingent convertible bonds (CoCos). These instruments allow for the recapitalisation of the bank as a going concern. A CoCo is in fact a perpetual security that pays a non-cumulative coupon and whose principal is automatically written down or converted into equity when its issuer’s CET1 ratio falls below a certain trigger.1 The privileged regulatory treatment – foreseen also by the transposition of Basel III standards in EU law, with the CRD IV and the CRR coming into force in January 2014 – has spurred the growth of the CoCos market in Europe. The volume of outstanding CoCos has risen from €33.8 billion in January 2014 to €107.4 billion in November 2016 (Figure 1). There is nevertheless a vivid debate on the convenience of allowing CoCos as capital instruments for regulatory purposes. CoCos’ supporters claim that their contingent debt-equity nature represents a plus – first, as debt instruments, they carry a lower issuing cost relative to common equity; second, as equity instruments, they provide a ‘pre-committed’ capital injection enabling the bank to strengthen its capital position precisely when raising equity would otherwise be difficult (e.g. Duffie 2009, Squam Lake Working Group 2009, Flannery 2016, Vallée 2016). Sceptics of CoCos in contrast argue against this double nature which – although theoretically appealing – introduces into practice too much complexity, with potential destabilising consequences on financial markets in the case of conversion (e.g. Goodhart 2010, Admati et al. 2013, Allen 2012). In a recent paper, we use the CoCo market dynamics observed in 2016 to empirically address the question about whether these securities are effective instruments for bank recapitalisation (the supporters’ view) or if they are rather destabilising (the sceptics’ view) (Bologna et al. 2018). Contagion in the CoCos’ market? The market of CoCos experienced two periods of significant turbulence in 2016. The first took place in January after the announcement of negative earnings expectations by Deutsche Bank, which came as a surprise for market participants. This period was accompanied by great uncertainty, as investors were concerned that the coupons on Deutsche Bank’s CoCos would not be paid. The second market distress event started in September 2016, when a number of articles in the press announced that Deutsche Bank had received a large fine by the US Department of Justice. During both events the yield-to-maturity of Deutsche Bank’s senior bonds and CoCos peaked to historical maxima. 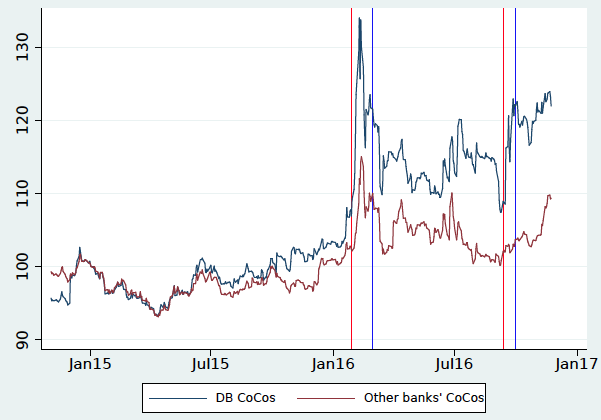 The CoCos issued by the most important European banks also experienced severe tensions, especially during the January episode when their average yield-to-maturity attained historical maxima (Figures 2 and 3). Source: Bank of America Merrill Lynch Contingent Capital Index (BAMLCCI) and authors’ calculations. These market dynamics could have been the result of the contagion from a systemically important institution (as is Deutsche Bank) to other banks through ‘fundamental channels’ stemming, for instance, from the network of interbank exposures or the possibility of fire-sales. 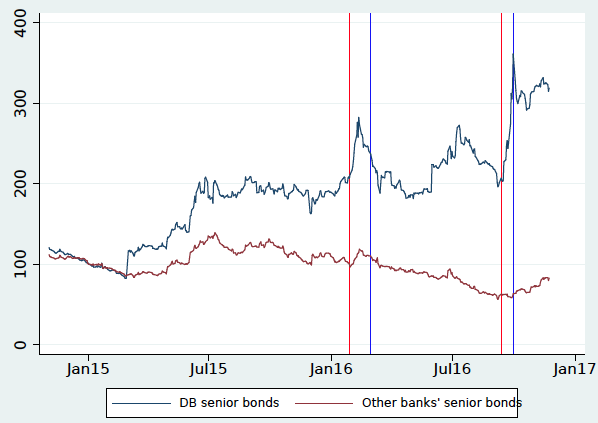 Yet, the overreaction of the CoCos market relative to the senior bonds market suggests that, in addition to possible fundamental distress propagation, the CoCos market could have been further destabilised by a sudden repricing of the risk of these instruments following the unexpected news about Deutsche Bank. Such a ‘CoCo-specific contagion’ constitutes the type of concern raised by the sceptics of these instruments and was frequently emphasised by informal commentators of these events. the yield-to-maturity of Deutsche Bank’s CoCos and its interaction with a dummy for each of the two events. The first set of controls aims at capturing the extent to which the CoCos yield-to-maturity can be explained by the banks’ fundamental variables such as their solvency risk (proxied by the yield-to-maturity of the banks’ senior bonds) and their expected profitability (proxied by the banks’ stock return). These variables allow us to control for the fundamental contagion from Deutsche Bank during the two episodes, by capturing how such contagion may have affected CoCos prices. The second set of controls aims at identifying whether any interdependence between the CoCos of Deutsche Bank and those of other banks increased due to a CoCo-specific contagion when Deutsche Bank was under stress. The motivation for allowing banks to also rely on CoCos to meet their regulatory capital requirements is that, while most of the time cheaper than common equity due to their debt features, they should, similarly to equity, provide loss-absorption capacity by enabling the ‘automatic recapitalisation’ of an institution when it is in distress. Our results show that, during 2016, the possibility that the coupon payment on the CoCos issued by a single bank might be suspended led to very adverse dynamics in the entire market for CoCos that cannot be totally explained by banks’ fundamentals. Although we find some evidence that part of the instability in the CoCo market could be transitory, authorities should keep on monitoring the development of this market and its behaviour under stress. The recapitalisation of the banks as a going concern provided by CoCos cannot be detrimental for the stability of the rest of the market. Should the operational features of CoCos keep on proving destabilising in future stress situations, rethinking their role as bank regulatory capital tools would be necessary. Admati, A R, P M DeMarzo, M F Hellwig and P C Pfleiderer (2013), “Fallacies, irrelevant facts, and myths in the discussion of capital regulation: Why bank equity is not socially expensive,” Max Planck Institute for Research on Collective Goods, 2013/23. Allen, H J (2012), “Cocos can drive markets cuckoo,” Lewis & Clark Law Review 16: 125. Avdjiev, S, A V Kartasheva and B Bogdanova (2013), “Cocos: A primer,” BIS Quarterly Review, September. Bologna, P, A Miglietta and A Segura (2018), “Contagion in the CoCos Market? A case study of two stress events ,” Bank of Italy, Temi di discussione (Working papers), forthcoming. Duffie, D (2009), “Contractual methods for out-of-court restructuring of systemically important financial institutions,” Submission Requested by the US Treasury Working Group on Bank Capital, draft of 9 November. EBA (2016), “2016 EU-wide stress test results,” European Banking Authority. ECB (2016), “Frequently asked questions on the 2016 EU-wide stress test,” European Central Bank. 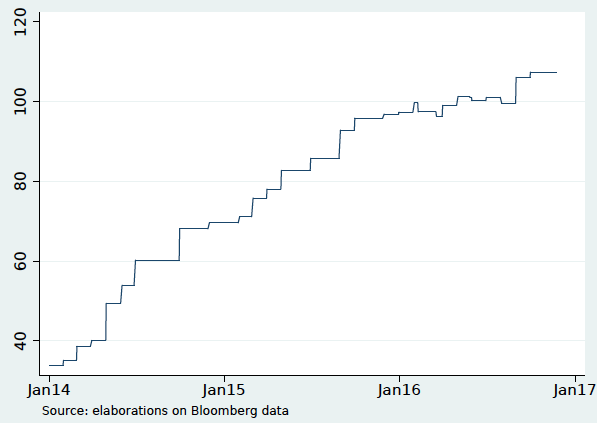 Flannery, M J (2016), “Stabilizing large financial institutions with contingent capital certificates,” Quarterly Journal of Finance 6: 1650006. Goodhart, C (2010), “Are cocos from cloud cuckoo-land?” Central Banking 21: 29–33. Squam Lake Working Group (2009), “An expedited resolution mechanism for distressed financial firms: Regulatory hybrid securities,” Council on Foreign Relations, Working paper 10. Vallée, B (2015), “Contingent capital trigger effects: Evidence from liability management exercises,” Unpublished working paper. For a detailed description of the main design elements of CoCos, see Avdjiev et al. (2013). In particular, we describe in our paper the clarification provided in EBA (2016) and in ECB (2016) on the conditions that may call for the suspension of coupon payments (Bologna et al. 2018).